I believe circle can get rid of corners in people’s hearts and softens them. Circle can lead the world to endless peace. Human is bound to die. The world is full of hardship. I want people to forget their worries and pains at least while enjoying my art. I want to reach to world peace by tiny pieces of circles. The above statement was made by Yume Matsuo, a 31-year-old artist when she spoke to a group of art students at a community college in Pensacola, Fla. on Nov. 1, 2017. A Wakayama native, Yume recently debuted as an Invited International Artist of the 45th Great Gulf Coast Arts Festival, held in Pensacola (Florida is a sister state of Wakayama). 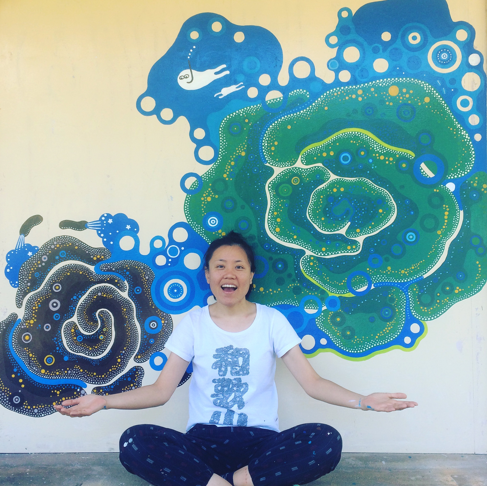 Yume was the second Japanese artist invited since 1999, when a master woodblock artist from Pensacola’s sister city of Hagiwara (now known as Gero), Gifu Prefecture, became the first international artist for the festival. 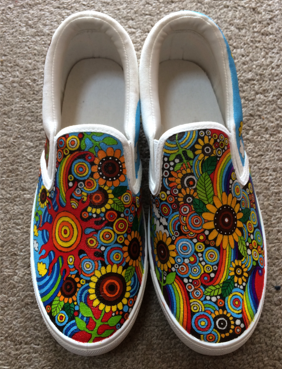 Yume’s painting style is a collection of small circles, dots and lines. Her work may resemble that of Gustav Krimt, or a piece of a mandala, a manga, or graffiti. Born in 1986 to an “ordinary salary-man’s family,” Yume grew up with her older sister and younger brother in Wakayama city. She has loved drawing since she was a child and once wanted to become a manga artist. She graduated from a graphic designing school in Osaka but she worked as an “ordinary office worker” in Wakayama city. After four years, in September 2011, she left her job and went to Ireland to study English. Yume traveled through Europe for a year and half. Then she came back to Wakayama and worked again as an office worker. For Yume, art was one of her hobbies, but drawing was always with her that cheers her up. The first thing that Yume wanted to do was to visit Miyakojima in Okinawa. She wanted to wear a T-shirt that would show people she is from Wakayama. 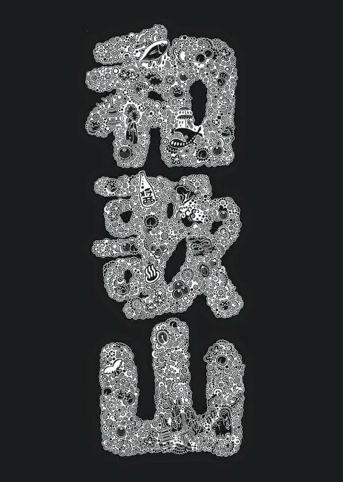 So she designed a T-shirt featuring the three Chinese characters of the word “Wakayama” consisting of small circles and swirls, embedded with iconic places and products of Wakayama such as tangerines, waterfall of Nachi, whales of Taiji, hemp-palm scrubber, soy sauce, Koyasan Temple, etc. “It took me three weeks to finish. I posted my T-shirt on my Facebook and Instagram pages. I got some inquiries even from overseas.” Yume’s has over 2,000 followers on her Instgaram page. 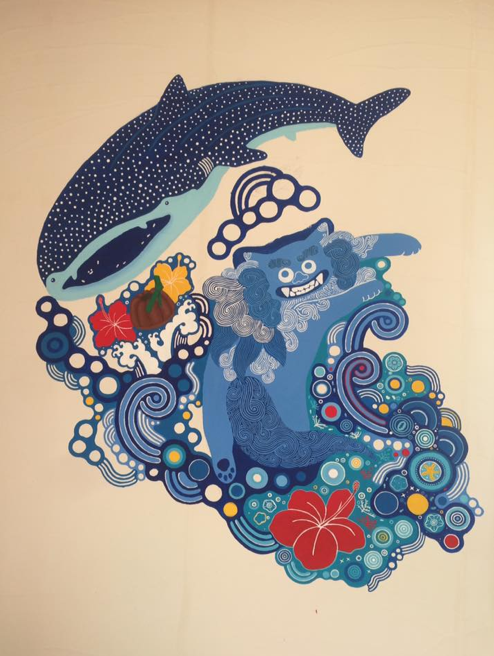 Then Yume had an opportunity to take part in the Japan Railroad Kinokui Trainart (Train + art) 2016, where she painted several murals of JR Kii-Arita station in Kushimoto city, Wakayama. The area was not familiar to Yume, so she snorkeled in the ocean and was surprised to see that beautiful coral existed. She took coral as the motif of the design of the murals using her favorite colors, green and blue. Yume continued to participate in the JR Trainart 2017 to keep painting. The Arts Festival showcased 200 artists selected from among 600 applicants from throughout the nation in the first week of November. Yume sat in her booth and drew circles on a postcard-size paper representing an individual whom she met. 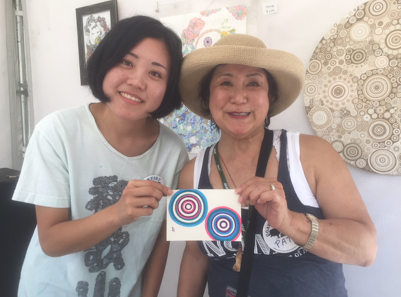 This project is called “Your Circle,” which is similar to a portrait but Yume expresses the images of the person with circles, using different colors and sizes. It took nearly 20 minutes to finish a piece of work but it was very popular. “Definitely, I would like to come back to the U.S. I would like to keep traveling, working and enjoying my life,” Yume smiled.